Surrounded by green, wooded hills and crystal clear water, Mespelbrunn is one of the loveliest castles in northern Bavaria. 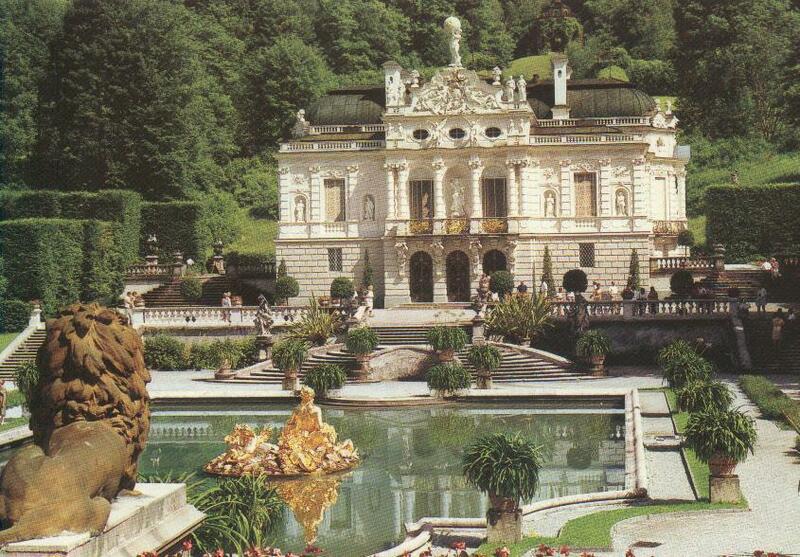 Hidden in a small, romantic valley, it was not destroyed in the thirty Years War nor any later. It is so well hidden it was almost impossibly to find. 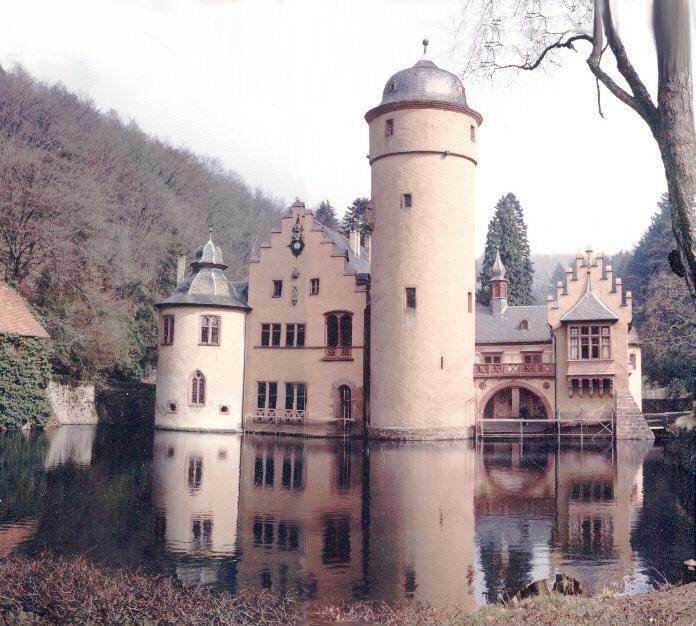 For that reason, Mespelbrunn is one of the few castles in Germany that has retained its original form and furniture. The oldest part of the castle is the mighty tower. Its origin goes back to the thirteenth century. 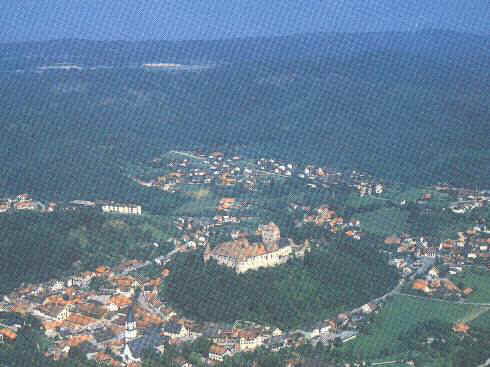 In that time it had to protect the road "running through the valley, a by-road of the Wuerzburg highway, which already in the middle-ages was the most important road through the Spessard. The chief part of the tower was built by the knight Hamann Echter in the early fifteenth century (1419-1432). It now contains the family-archives and the library. The oldest document you find in it is of the thirteenth century. The other part of the castle was erected by the knight Peter Echter It was to replace a smaller building which stood between the tower and the chapel. The northern and eastern aisles of the castle are supported by picturesque columns. Those on the north side are of wonderful stone-cutting, decorated with rosettes, heads of angels and masks, very typical emblems of the Renaissance style. This part of the castle is entirely built in German Renaissance style. On one of the columns you see the alliance coat of arms of the knight Peter Echter and his wife, a Lady Adelsheim. The three rings are the coat of the Echter Family, the horn that of the Adelsheim. Carved above is the date 1564. The Knight’s' Hall: We begin our walk through the castle with the knights' hall. This is the room where formerly the knights assembled, a very imposing room. The porches, windows and the columns are of red sandstone, showing excellent craftsmanship. The hands at the base of these columns symbolize the steadfast clinging of the house and its inhabitants to the soil. There is a tale that as long as these columns in the knights hall are standing, the Ingleheim-Echter family will flourish. Between the double columns you see a well, that is the Mespelbrunn, in English "medlar-tree-well". In the middle-ages a spring was the symbol of life, and this spring with Its caring of a man and woman symbolize the same. The armor and pikes are of the sixteenth century. The tables and cupboards were made about sixteen hundred. The windows were painted by Countess Antoinette Ingleheim. They show the genealogical tree of the last Lady Echter, her coat of arms below, above the coat of arms of her parents, grandparents, great grand parents and so on. 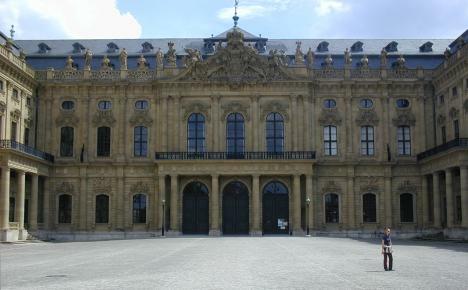 The other windows on the left show the genealogical tree of her husband: Count Philip Ludwig von Ingleheim. By grant of the Kaiser he combined his name and coat of arms with that of the Echter family~ So the possessors of the castle, his decedents, are now called: Count Ingleheim Echter von Mespelbrunn. 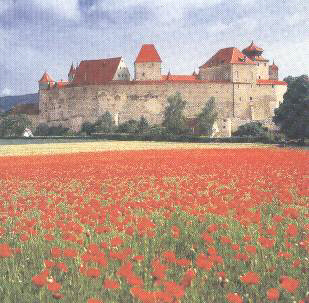 The old parchment bill with the Kaiser's grant is still in the family archives .Chapel: The low tower at the north-west corner of the castle contains the chapel. It is a lovely room with painted windows and arches, late Gothic style. It belongs to the older part of the castle. 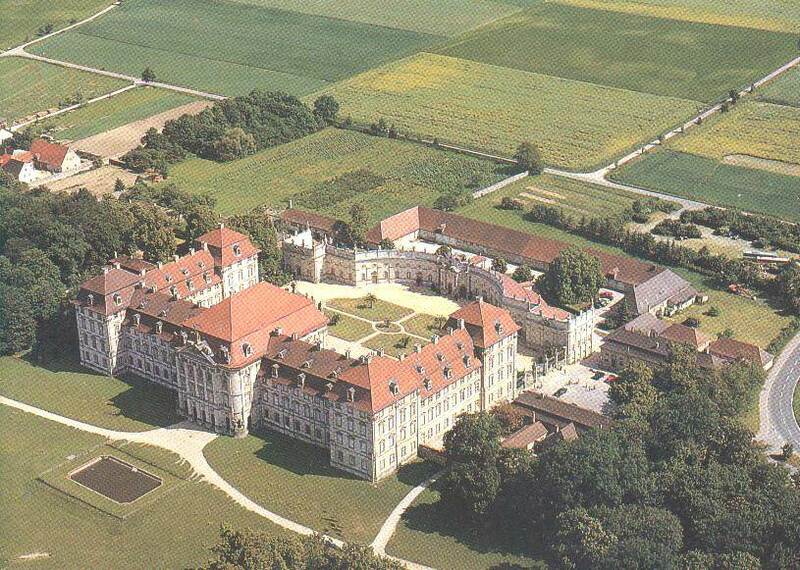 The knight Hamann Echter had it built and established a farm for a priest to live on. Until recently a priest lived there and celebrated Holy Mass here every day. The fifteenth century pictures in the stained glass windows are very precious. The alter was established in about sixteen hundred by another member of the family. It is made of alabaster by the Wuerzburg master Michael Kern. The wall paintings were made in 1729. 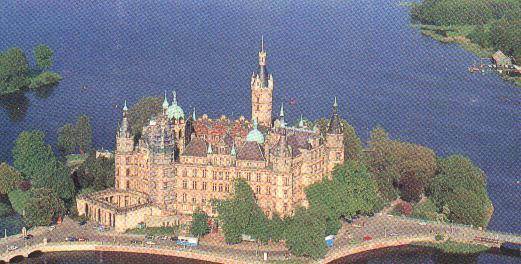 Several years ago I spend one month traveling in Germany and the Czech Republic visiting as many castles as I was able to see. return flight would leave for Canada. 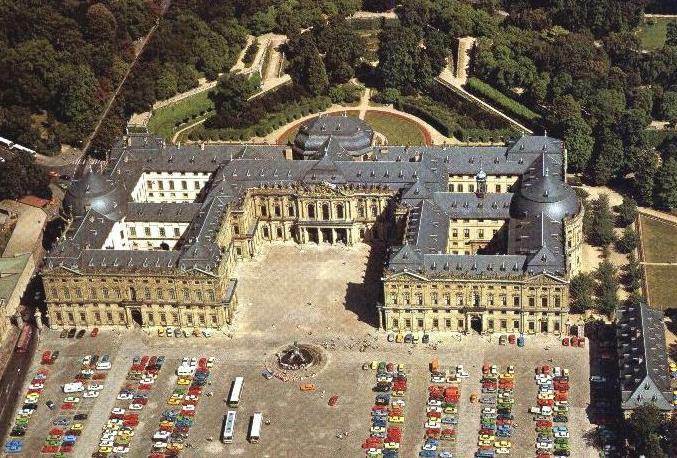 This is the ancient seat of the House of Hohenzollers, whose family members were not only the Kings of Prussia, but later on in history became the Emperor's of Germany. 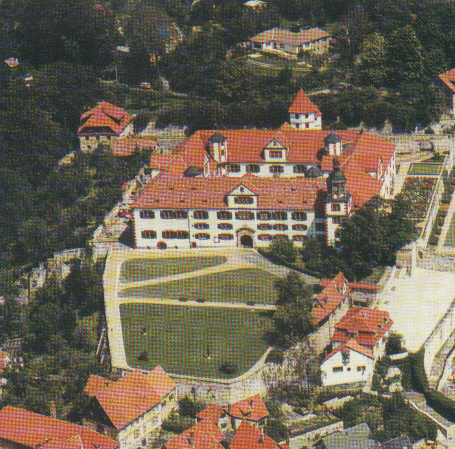 In 1900 it was rebuilt by King Frederich Wilhelm IV of Prussia. 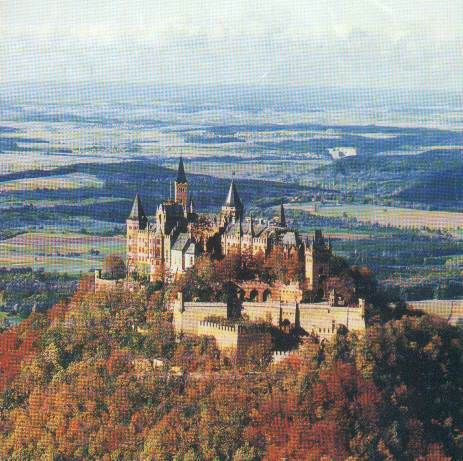 At the present time, this castle still belongs to the family Hohenzoller.